Budgeting income and expenses during a divorce is so important, yet it's often overlooked or not taken seriously. With a well-documented budget, you can give proof of the standard of living that was maintained during the marriage. Plus, a detailed budget can help you realistically approach living solely on your own income. If you need a system to help you track everything, you can use Quicken or similar software to manage your budget. The following article highlights the importance of developing such a budget, as well as gives tips to help you get started. Mention the word budget and the reactions vary from boredom to frustration to near panic - rarely does it generate a positive response. However, in divorce, budgets are an indispensable tool. Unfortunately, many couples facing dissolution have little experience in preparing budgets with the level of detail necessary to support equitable settlements. While obvious to the professionals involved, clients often ask why the tedium of creating a budget is so important; especially when I tell them more than one is necessary. My response is, first, an historical account of family income and expenses is critical to demonstrating an established standard of living and resulting financial need. Post-divorce maintenance, child support, and even temporary support during the divorce proceedings (which may last over a year), rely on historical validation. Second, it reveals any need for special expenses associated with childcare that may not be addressed by routine assumptions (e.g. private school costs or specific medical expenses). Third, if one spouse is attempting to shelter income from the court (e.g. under reporting self-employment income, bonuses and other financial perks, or investment returns), this may be revealed by showing an inconsistency between declared income and actual budgetary expenses. 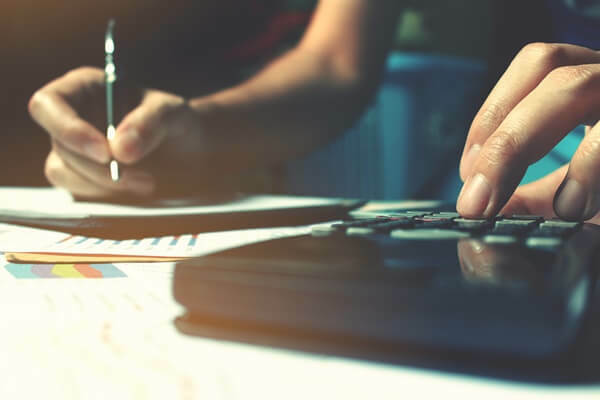 Fourth, a post-divorce budget is the only reliable way to forecast future expense and income needs in order to file an accurate Financial Declaration with the court, and creating this budget is much easier knowing the pre-divorce (historical) budget. It is impossible to evaluate settlement options realistically without this estimate of post-divorce income and expenses. The quality of life cannot be captured in a spreadsheet. But facing the documented realities of a restructured financial future resulting from divorce is often a painful introduction to the impending necessity of changing one's lifestyle. Assuming that either spouse's standard of living will not be significantly affected is to court emotional and financial disaster. Unrealistic assumptions about housing, transportation, childcare, entertainment, clothing, domestic services, healthcare, education, careers, retirement, and the other myriad facets of contemporary life cloud the dissolution process, delay settlement, create fear and suspicion, and create unsustainable expectations that can become substantial barriers to equitable settlements. Divorce causes financial change. Change requires adjustment. Adjustment means compromise. Compromise means giving as well as taking. The logic is simple enough, the human acceptance gets complicated. It is important for clients to identify and accept the compromises inherent in divorce early to give both parties an opportunity to assimilate and plan for the real changes this event will cause. Giving up the maid in a four bedroom house to clean your own 2 bedroom condo seems easy enough until you are scrubbing the toilet on hands and knees when your five year old got sick Sunday night after Dad called him, and you still have that report to finish for an 8:00 AM meeting. Meanwhile Dad's feeling lousy because he hasn't seen the boy for over a month, is angry about missing his Little League game last week, and wondering how he can get his car windshield replaced with a child support payment due next week. Preparing accurate budgets for historical, temporary support and post-divorce life for both spouses doesn't guarantee acceptance of change, but it removes some of the most significant barriers to that process. It helps level the playing field and gives both parties a realistic view of the present as well as the future so they can make informed, rational decisions. Before exploring the process I have developed for budgeting income and expenses, here is a reality check based on the most current published figures from the U.S. Bureau of Labor Statistics. While the financial circumstances of every case are unique, the national data below demonstrate the universal issues driving the need to prepare accurate budgets. *Excerpted from US BLS 2006 Survey, Table 4. For the sake of a general example, assume a couple with two children expects to have both children reside with one parent following the divorce. From a total income of nearly $90,000 supporting four people spending an average of about $64,000 per year, the custodial parent will be incurring over $56,000 of expenses while the other parent spends an average of over $29,000, for a total of over $85,000 - an increase of nearly 33 percent. Assuming no change in employment, it is not reasonable to expect the combined income figures for a one and three person family to be additive (if they were, the sum of about $104,000 would suggest no real financial problem). Where will the funds to cover the additional expenses come from? Certainly the non-custodial parent cannot cover the $21,000 shortfall by cutting it out of the $29,000 he or she is expecting to spend. Even if the couple agrees to share the increase equally, both spouses will have to reduce their expenses by over $10,000. That kind of reduction requires taking a very sharp pencil to, yes, a budget. Perhaps only one spouse is currently employed. If so, there may be an opportunity to increase income via the other spouse getting a job, but that may entail retraining/education costs, and the expense burden can't be suspended during that time. Of course this is a very generalized example based on average figures, but the point remains: a close examination of spending habits is necessary to create a post-divorce plan. It is also worth pointing out that while the figures in the government tables include all sources of income, they do not include outstanding debt from credit cards, lines of credit, credit interest, personal loans, etc. Given the current debt load of "average" families, planning for such items as increasing healthcare costs, balloon payments, and adjustable rate mortgages, makes budgeting for divorce critical. Because analyzing settlement options using financial models based on reasonable assumptions and realistic post-divorce budgets is so important to my clients, I spend considerable time working with them on historical budgets. When this process is properly structured it creates a template for the succeeding temporary and post-divorce budgets. There are many ways to create a budget using paper and pencil or software like Money, BudgetMap, Quicken, and Mint.com. There is no inherently right way. The first step in preparing an historical budget to document the family's spending habits usually requires a concerted, time-consuming process of collecting check registers, credit card statements and receipts, banking statements, paycheck stubs, investment transaction records, and any other information on what the family spent, and what it received. This can take weeks, and may require outside assistance from accountants and others, but it is imperative to gather complete, accurate, pertinent information. 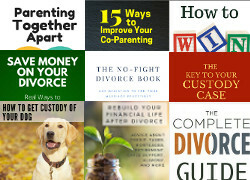 For a detailed listing of the information that should be gathered in this process, see the Document Roundup List published in chapter 6 of my book, Fair Share Divorce for Women, Second Edition. As the data is collected it should be organized in a manner consistent with how it will be used. The best way to do this is to use a copy of the Financial Affidavit required by the court processing the divorce. In many states this is a standardized, detailed listing of expenses and income by specific categories. These categories are a good guide for creating folders in which to store the relevant documents because ultimately the average monthly totals for these categories will have to be submitted to the court on that form. Eventually there will be three sets of folders or binders - historical, temporary, and post-divorce - each with the same basic organization. I have had clients use pocketed 3 ring binders, portable file cabinets, banker's boxes, CDs of scanned documents, even an index card system referencing files locked in a safe deposit box to organize historical records. The method of filing is not important, but the ability to retrieve data as needed is. From these records a budget form is created either manually or using a computer. With my clients I build interactive spreadsheets in Excel or maintain records in Money or Quicken, depending on the quantity and complexity of the data. A copy of the format I use can be found in Chapter 6 of my book. Section 1 of the historical set should contain a summary of spending during the year (not just a few months) prior to the divorce filing. It need not be longer than 5 pages; its purpose is to demonstrate that the analysis of historical spending has been detailed and is thoroughly documented. The actual details will be stored in section 2 of this set. The summary should note any unusual sources of income or expenses, like one-time gifts, an inheritance, a remodeling project or special vacation, etc. An important element of Section 1 is footnoting. Use footnotes to provide additional perspective to the lifestyle of each family member. For example, use a footnote to explain a child has participated actively in a sport for the last several years and given their proficiency now has a private coach, or that a particular gift expense has been a family tradition for the last decade, or that a vacation expense is composed of specific amounts for lodging, transportation, personal assistants and food, rather than a single dollar amount. These details help the court understand the true quality of life experienced by family members prior to the divorce. Section 2 will contain files for each of the categories listed in the Financial Affidavit form. This is the detailed backup data to support the summary in Section 1, and will contain statements, invoices, charge slips, receipts, etc. for all expenses and income sources. Section 3 is a calendar and diary to record the highlights of what happened during the relevant time frame. For example, dates of children's sports events should show the activity, the spouse's time involvement, and relate to associated expenses detailed in Section 2 to lend credibility to them and demonstrate the spouse's commitment to the activity. In the corresponding sections of the file sets for temporary and post-divorce budgets, this section will be used to document how well a temporary parenting plan is working. It can show if one spouse is taking advantage of the other by being consistently late in picking up or early in returning a child, or missing appointments. 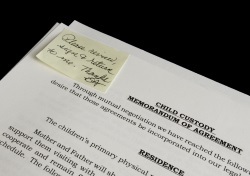 This type of documentation is valuable in negotiating during the divorce, as well as in post-divorce requests for revisions of child support, and establishing the permanent parenting plan. It is important for clients to understand this historical record must be accurate. 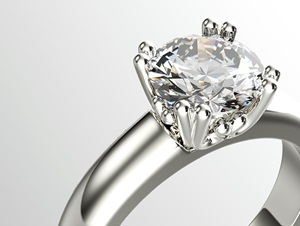 That means being honest about whether a spouse has spent discretionary funds freely for personal items like clothing. Hiding expenses creates problems. Identifying such areas generates an opportunity to suggest changes in temporary and post-divorce budgets that demonstrates a spouse's willingness to be reasonable and realistic in accepting necessary financial changes. Once there is a change in living arrangements (e.g. one spouse moves out or income and expense handling significantly changes), even if the Financial Affidavit has not been submitted, the second set of files for the temporary budget becomes active. From this point until a settlement is agreed upon and the final decree is granted, all expenses and income are part of the temporary budget, and will be used to document the spouse's interim lifestyle. This budget will also provide, in conjunction with the historical budget, a foundation for developing the post-divorce budget, which will be used to evaluate settlement options and establish a financial plan for after the divorce. The same budget worksheet format used in the historical budget should be used for all three budgets. The key elements of both the temporary and post-divorce budgets are Sections 2 and 3. It is sometimes useful to put a copy of the historical budget Section 1, containing the financial summary and final Financial Affidavit in these sets for reference. These two budgets will differ from the historical version, and from each other. The temporary budget takes into account the changes in housing, transportation, childcare, etc. that reflect the reality of life as a single person. The post-divorce version will have to realistically forecast a lifestyle that is sustainable well beyond the final decree. As part of the final budget, I give clients a twelve-step process for creating a cash management system to help monitor and adjust their post-divorce financial plan. If all this sounds like a lot of work, it is. It can also be expensive, depending on the degree of spousal cooperation, size of the estate, complexity of family finances, and most important, the willingness of a client to be their own clerk in gathering and organizing data. But the reward is worth the effort. Just as a spreadsheet budgeting income and expenses cannot capture the quality of life, neither can it repair a post-divorce lifestyle jeopardized by incomplete data and poor planning. Kathleen Miller, CFP, MBA CDFA, is president of Miller Advisors, Inc. and author of Fair Share Divorce for Women. She is a member of the Financial Planning Association and Institute for Divorce Financial Analysts.